From a birthday Burgundy to an anniversary Syrah, some wine bottle corks are destined to become keepsakes. From a special birthday Burgundy to that unforgettable anniversary Syrah, some wine bottle corks are destined to become keepsakes. Toss them in a plastic cup or drawer? Rude. Preserve them all with this state-shaped display board. Crafted from Baltic birch plywood, it becomes an art piece worthy of a wall in your dining room, kitchen, or wherever you like to toast together. Made in Tampa, Florida. All states are 1/4" in thickness and approximately 17"L x 17" W (size varies per state). Arrives with metal hardware for mounting on the wall. Screws not included. 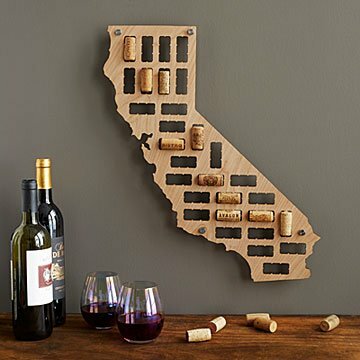 This is a great gift for California residents or for California wine lovers. My friend fit in both categories so this was the perfect gift. As a wine lover, I save corks of special/pricy wines or wines that I had with friends that brings back good memories. What' a great way to display them. Nice conversation starter when you have visitors too. I wish there were France and Italy-shaped wine cork displays also to display French and Italian wines corks. I would definitely buy again. Very well made. Well written instructions and made the perfect gift for my Montana girl. I ordered the Georgia map. I bought a black chain from the hardware store and a hook to display the board behind my stove top. I even stained the board a little darker. I bought this for my sister and she really loved it. Later that night we already had two corks in place. This looks great hanging in our kitchen. Always get so many compliments! It's shown as a wall hanging, but the included hardware seems better for a horizontal surface, like a trivet. If I was supposed to be able to mount this on the wall, I don't see how. The pegs really work best to lift it up off a table and keep it balanced, not for hanging. This is a nice idea for a wine lover who has enough glassware and fancy wine corks. A creative idea that they can customize with their own corks. The wood is thinner than I expected, but still looks very nice. Didn't include the screws needed to hand this flimsy piece. Not worth the money and I will be returning for a refund. My brother is a wine lover who lives in Michigan and travels all over the world searching for great wines. This will help him remember and brag about the great ones.